Tis the season of the Iris, and I love every minute of it. It doesn’t last long so I make sure I go out to check on them every day because I don’t want to miss one beautiful bloom. Are you a fan of the Iris? The regular lilacs have been finished for quite some time, but the dwarf Korean Lilacs are just finishing up. If you are every looking for a compact shrub that has beautiful fragrant blooms in the spring and lovely foliage the rest of the year, I can highly recommend the Dwarf Korean Lilac. I bought one maybe eight or nine years ago and have since divided it into about six plants, and I love them all. The Peonies are up next. It just makes me smile to look out the window. What doesn’t make me smile are the homesteading habits of the huge population of chipmunks and squirrels we deal with because of our large oak trees. I know, I know, many of you think they are cute and enjoy taking photos of one or two of them. That’s fine, but here on the farm there are so may that they destroy some fruit and vegetable crops and make more work for the weeder in charge – me. Want to guess how many of these sprouted acorns I pulled out of just one bed? 10, 20, 30? How about 69 in one bed. I’m headed back out this morning to pull more. The perennials are doing well, but the container plants are another story. They are all alive but with so many cold, wet, dark days, they are just sitting and resting. If I’d taken photos of when I planted them and today, you wouldn’t see much of a difference. I fertilized them again yesterday hoping to give them a little nudge. I do have a couple of flowers on my tomato plants – picture the happy dance here. 🙂 But, gardening is never simple. 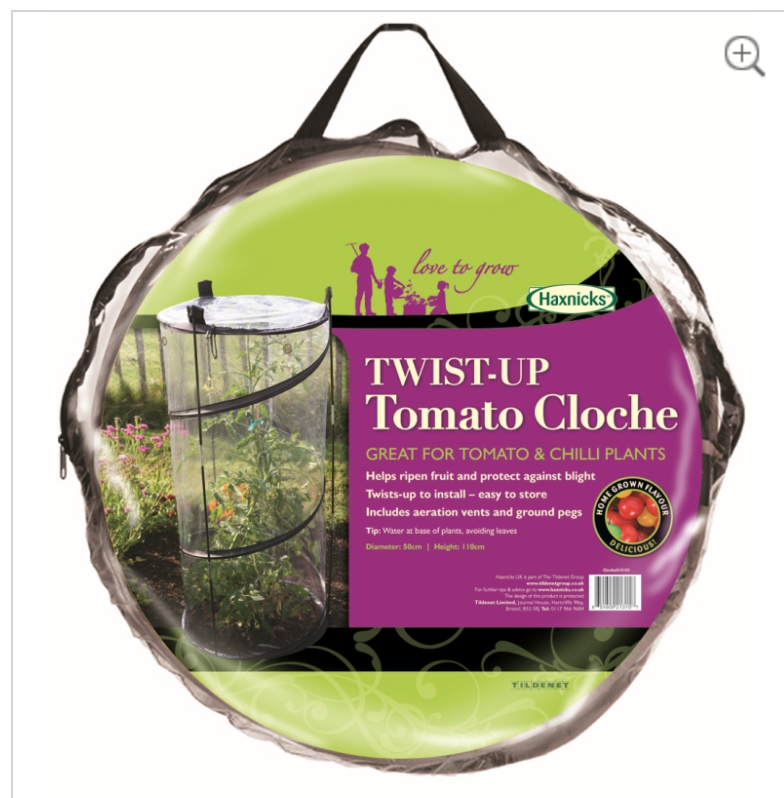 I bought these interesting clear plastic twist up and down tomato cloches to protect the plants from early blight. They work great, but now the concern is whether I will get as many tomatoes if they are enclosed in the cloches. Wind and movement helps the blossoms turn into fruit so we’ve added additional grommets so air can flower easier. But, I’ll probably take them off when we aren’t getting heavy rain. I did start my fabric piece using a photo of our barn. It is as challenging as I thought it would be. I sewed on it one rainy day, and the next day I spent a couple of quality hours picking out stitches. I’ll get back to it. In the meantime, I did finish a couple of small hand projects that I am happy with. I will be on line sporadically for the next week because on Thursday we’re headed to the Midwest for a Celebration of Life and a family reunion. This entry was posted in Gardening and tagged Acorns, Gardening, Haxnicks, Irises, New Hampshire, Organic gardening, Perennials, Photography, Tomatoes, Twist up tomato cloche. Bookmark the permalink. I was in Virginia this past weekend and the farmers are fretting about the cotton, which is also sitting and waiting for warmer weather. Like you, I love iris. Even though their show is brief, they will always have a place in my garden. I was chatting with another blogger about reblooming irises. Have you had any experience with reblooming varieties? Love your irises. Ours came and went already, but we still have the peonies. And they are such happy bundles that peonies make me smile too! Safe travels and happy family gatherings! Our gardens have gotten a bit wild with weeds but the irises are poking through… beautiful. Irises are my absolute favorite flower. Bar none. Yes, the cool, rainy weather has not been good for potted flowers and other warm-loving plants. I might have to replant my basil as it looks so poorly. Your smaller pieces of sewing are lovely. Look forward to seeing the barn. Bon voyage and safe travels! Beautiful flowers, Judy. This has been a challenging spring. Travel safe and enjoy the reunion. Thanks for posting our state flower: The Iris!!! I knew you loved Tennessee deep in your heart! 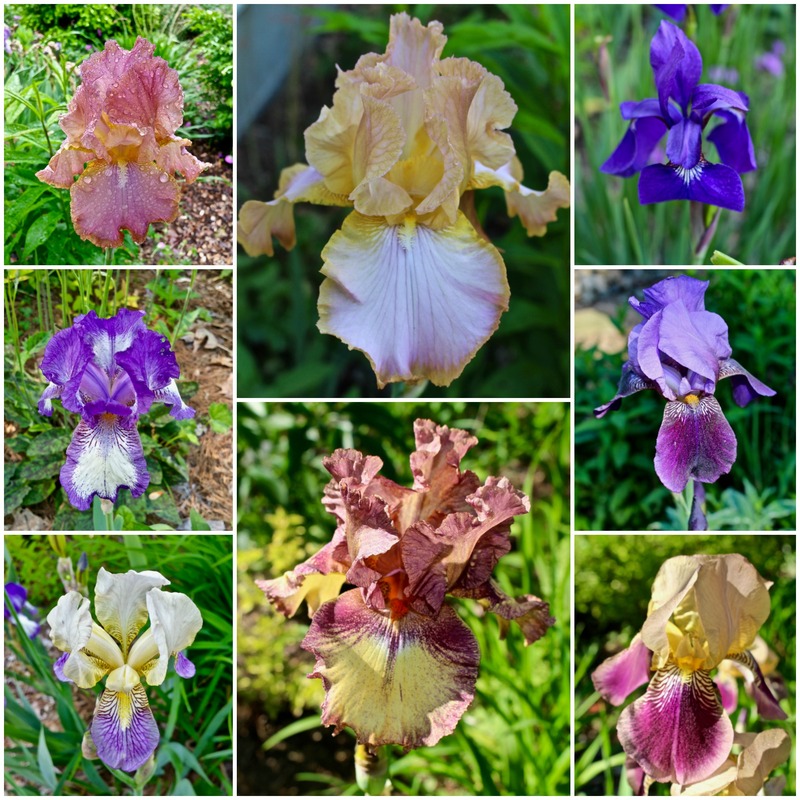 Your Iris collection is just beautiful, Judy! I am a huge fan of Iris and wish the blooms lasted a bit longer. Korean Dwarf Lilacs are on my Wish List. Thank you for letting us know that they can be successfully divided! What a crop of acorns!! 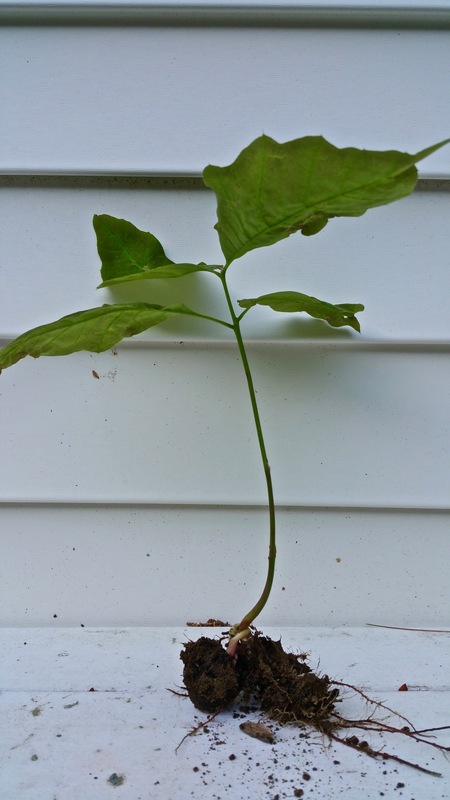 In my garden, I am continuously pulling little maple tree seedlings. If we don’t keep up with our little trees, before long we will be living in a forest! I pulled 110 more sprouted acorns this morning. It about blew me away. Talk about a forest. 🙂 I love those little lilac bushes. They are delicate and just kind of make you smile. Oh, I love Iris’. There’s an Iris farm up in the foothills that I’ve visited a few times. I’ve yet to hit it when the Iris’ are at their peak of perfection though. One year! 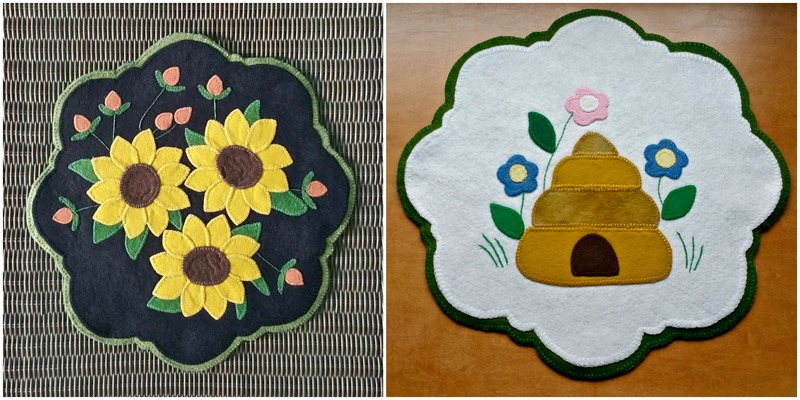 The hand-stitched bee hive is lovely! Have a wonderful reunion, and safe journey! Well, I called it a farm, but they call it a Garden. 🙂 It’s pretty, but I’ve been a bit late each time I’ve gone. One of these years I hope to hit perfectly. Here’s their website if you want to take a gander. Do any rebloom in your growing zone? There are so many rebloomers that are beautiful it would be hard to pick. Firey Echo, and Etched Burgundy really are unique. I’ve heard from some that they’re easy to grow. Ooh, I’m off to check those out because I do not have any that rebloom. Thank you! Following your Spring is like being blessed with a second one! Thanks for the lovely photos. I LOVE iris! I didn’t always but used to think there were only the only the one purple one! There are so many and they are so pretty. They won’t grow well here so thanks for sharing yours. Not a fan. Was given some as a starter. Few yrs later they needed dividing. Was like blasting cement to cut thru roots. I esp. like your sunflower mat – the little random buds (strawberries?) around them are a nice touch. I’m glad your flowers have come back. Mine are suddenly considering the idea of blooming. At least some of the lilies have buds. I can’t tell about the roses, but they’ve shot up about two feet in every direction. They’ve gotten HUGE — without flowers. Our dwarf lilacs — there are two — did very well this year. They bloomed for more than a month. Our regular lilacs bloomed like crazy, too … and of course the crazy columbine. Interesting flower year, don’t you think? Oh, I love your sewing pieces. Just lovely! Funny you should mention chipmonks – We have them (at least 6 of them!) this year for the first time ever and I (and the cat) have loved watching them. But I see two dead rosebushes in the area they frequent. I am wondering if I should blame the little darlings for that. . .
Oh, wow – My strawberries are far in the back of the yard, but something has been murdering them. hmmmmm…….. And yes, about babying roses. My husband doesn’t mind the babying (I do). So our rule is, if you plant it, you baby it. I NEVER plant roses. lol – Oh, and I spelled it “chipmonk” on purpose. Ours are very religious. Ha ! I thought I was the funniest one on here. You got me, my lady. Bravo! Your experience with acorn seedlings is like mine with maple seedlings. Thankfully this year has been kind to me and seedlings have been few. One year I even had a seedling trying to grow in a crack in the wood on the deck. You have my sympathy … but the rest of your garden sounds lovely. LILACS!! Now there’s my favourite 🙂 I’ve been basking in the aroma of my neighbour’s tree for the past several days. Safe travels and hope the reunion is great! Ugh. I’m so sorry for you. It’s back-breaking work! I feed my critters away from the garden, so I’ve been fortunate. They know where to look for food, but now and again I lose something anyway, like a giant cabbage or every single bloom of ranunculus. Argh. I love peonies! We can’t grow them here so I have to make due with store-bought. I do love irises…and I love your stitched pieces. Chipmunks can really be destructive to a home, too. They were in the subdivision my daughter lived in and were getting under her house, and trying to get into their garage. So while I think they are so, so cute, I think they are cute in their place. I would love to see photos of the peonies when they bloom. They don’t grow here. It’s too hot. You know my feelings about chipmunks. But you might not know that iris have been at the top of my list of favorites since I was a kid. (So that’s a long time!) Thank you for the beautiful photos and for the description of your garden; I think it is trying to compensate for your dreadfully wet and dark pseudo-spring. Your needlework, as always, astounds me. I didn’t miss your comment about those quality hours pulling out stitches — very much like those quality hours pulling out sprouting acorns. It speaks to life, doesn’t it? I feel like we’re living parallel garden lives–admiring irises, cheering on peonies, pulling acorn sprouts. I came late to irises–I always thought they were too over-the-top showy, until I planted some and now I’m a convert! I hope your trip is safe and great for the family. The iris which is lemon colored with lavender was my favorite one. It was so pristine and lovely! The peach colored iris with raindrops and the light burgundy, frilly one with yellow attracted my eyes, too. They are all perfectly pretty, though! Oops, I took a lot of time but as I was getting ready to add a note about the two beautiful felt and cloth creative pieces. I would want to frame them and hang in my kitchen, Judy. Sunflowers and beehives are such “sunshine-y,” natural beauties. I also love irises. We have some in our library’s garden that are almost black and really gorgeous this year. I am fortunate that the former owners here planted several varieties of lilacs, including Korean Dwarfs, so we have many weeks of blooms. As for chipmunks, after our car-filter eating debacle earlier this year, I no longer find them cute. Peonies are very exotic to me as we can’t grow them here…enjoy! What a beautiful selection of iris. We have really enjoyed ours this year too as they flowered strongly. You have such a variety of iris there….just gorgeous ! The sewing projects are pretty…as to peonies when I take my morning walk a home down the street has both peonies and roses-with-scent ( so many do not anymore ) and I just inhale deeply as I walk by 🙂 Most iris are done here now and the daylilies are coming into bloom. Our daylilies just started blooming today. We must be in a similar growth plain. Gardening is truly an art and a craft! I can tell you enjoy the thinking and problem solving that meets every challenge! Love your sunflower and beehive table toppers! Absolutely beautiful! I just started gardening again this year after a bit of a break, so it’s still a work in progress. Every year I plan to expand and grow my garden. Only bigger and better from here. So pretty! Do you know if irises grow well in containers? I’m always looking for new flowers to add to my container garden. Thank you for sharing! Good question. I’ve put irises in raised beds, but I’ve never tried a container. However, I’ve put all kinds of other perennials in containers for the summer season and then put them back in the ground successfully so I don’t know why they wouldn’t work.